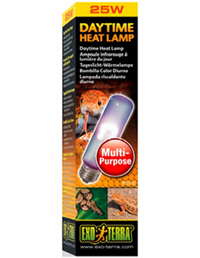 PT2102 - 25 Watt, UVA DAYLIGHT BULB * Broad-spectrum daylight lamp for terrariums * Creates heat gradients for thermo-regulation * Increases ambient air temperature * Stimulates breeding behavior through UVA rays * Can be combined with Night Heat Lamp or Infrared Basking Spot Lamp for a 24-hour cycle A broad-spectrum daylight lamp with a Neodymium sleeve. The spectrum is ideal for plant s photosynthesis and the UVA (ultraviolet A) light contributes to reptiles physiological well-being. Another important factor is the heat emitted by this bulb to increase the over all ambient temperature in the terrarium.